Are you awoken at night to the sounds of scratching or tapping coming from your ceiling? Does your house suddenly reek of a stale urine stench that won’t go away? If so, you might have rats in your attic. It is important to start the process of removing rats from your attic as soon as you suspect they are there because the longer they are in your home, the more damage they can cause. Most homeowners know they shouldn’t go near any wild rats, living or dead because their bodies harbor so many infectious diseases. However, you can still develop one of the many illnesses passed on by rats, even if you don’t come in direct contact with one. Rats can spread a severe disease through their urine called leptospirosis which can shut down your liver and kidneys. If rats wander around high-traffic areas of your home, they’re spreading their infected urine to places that you’re at every day. 3 cases of leptospirosis recently broke out in a New York neighborhood due to rat contamination. Two patients recovered while the third passed away. Health officials recommend that you wash your hands frequently, especially in an area where you could be in the presence of rats, and always wear shoes. To read more about this case, you can check out the New York Times article here. 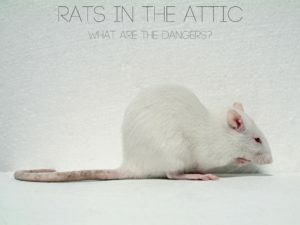 The techniques we’ve developed at Critter Control® Dallas allow us to get in, remove the rats from your attic, and get out in a timely fashion, always making sure your health is our number one priority. We’ll also repair any of the damages the rats might have left behind, including re-installing your insulation. To set up your free consultation, call us today at 817-222-1101.